For the ‘Superdads‘ in our lives, it’s not really about the gifts, but the thought which they appreciate the most. So this Father’s Day, in case you are at a lost on what to get your dad, a simple Red Ribbon Father’s Day cake would surely be considered a sweet gesture. When we were young, we considered our father to be our Superman, because even after work, he would still spend time playing games with us, share stories and even help us with our homework. 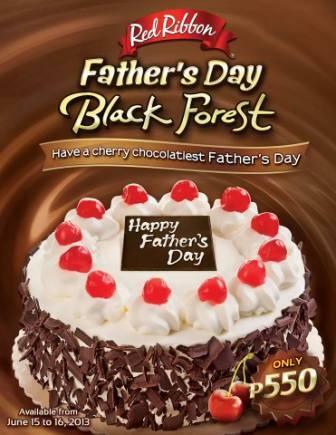 This weekend, say thank you to your Superdad with the limited edition Red Ribbon Father’s Day Black Forest Cake. The Father’s Day cake is available in all Red Ribbon branches for two days only – June 15 and 16, 2013 for the price of P550. The Black Forest cake is made with moist chocolate cake filled with cream and cherries and topped with chocolates and cherries. Most importantly, share the Red Ribbon Father’s Day cake with him and the whole family. The simple gesture will go a long way.